What is a coating thickness gauge? The coating thickness gauge can non-destructively measure the thickness of non-magnetic coatings on magnetic metal substrates (such as steel, iron, alloys and hard magnetic steel) (such as aluminum, chromium, copper, tantalum, rubber, paint, etc.) and non-magnetic The thickness of a non-conductive coating on a metal substrate (such as copper, aluminum, zinc, tin, etc.) (eg, tantalum, rubber, paint, plastic, etc.). The coating thickness gauge has the characteristics of small measurement error, high reliability, good stability and easy operation. It is an indispensable instrument for controlling and ensuring product quality. It is widely used in manufacturing, metal processing, chemical industry, Inspection areas such as commodity inspection. 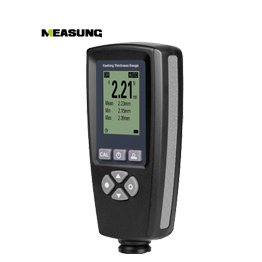 The coating thickness gauge measures the thickness of the coating by electromagnetic induction. The probe on the surface of the component creates a closed magnetic circuit that changes to varying degrees as the distance between the probe and the ferromagnetic material changes, causing changes in magnetoresistance and probe coil inductance. Using this principle, the distance between the probe and the ferromagnetic material, ie the thickness of the coating, can be accurately measured.